David Shields: Every artistic movement from the beginning of time is an attempt to figure out a way to smuggle more of what the artist thinks is reality into the work of art. In the summer of 2010, I read David Shields’ Reality Hunger over the course of a weekend. Much of the reading was done on the grass beside our town’s community pool. I periodically took breaks to jump in the water and cool off, but mostly I sat on a Tommy Bahama folding chair and read like a zealot. Since that weekend, my reading and writing habits have changed irrevocably (or as irrevocably as four years distance allows). I now almost never read novels unless they are pressed upon me by a family member or friend. I’ve populated my amazon.com wish list with titles from Maggie Nelson, Sarah Manguso, Wayne Koestenbaum, and John D’Agata. I discarded a novel in progress, told from the point of view of a teenager whose best friend had just killed himself after a botched school shooting, and instead began a lengthy collage piece about a man, very much like me, with problems very much like my own. After my daughter was born, I wrote an essay that detailed how hard it was to conceive her, describing the frustration and despair that I had fought so hard to conceal from everyone except my wife during our three years of infertility. David Shields (appropriating Robert Winder): How can we enjoy memoirs, believing them to be true, when nothing, as everyone knows, is so unreliable as memory? Many memoirs make a virtue of seeming unadorned, unvarnished, but the first and most unforgettable thing we learn about memory is that it’s fallible. Memories, we now know, can be buried, lost, blocked, repressed, even recovered. We remember what suits us, and there’s almost no limit to what we can forget. Only those who keep faithful diaries will know what they were doing at this time, on this day, a year ago. The rest of us recall only the most intense moments, and even these tend to have been mythologized by repetition into well-wrought chapters in the story of our lives. To this extent, memoirs really can claim to be modern novels, all the way down to the presence of an unreliable narrator. The full title of Reality Hunger is Reality Hunger: A Manifesto, and perhaps the subtitle is the reason why the response to the book has (for me) too often focused on its “controversial,” more extreme interpretations, like the death of the novel or the futility of copyright. The primary lesson that I learned from the book was that creative boundaries should not exist. Labels are unnecessary, and borders should be blurred: the best fiction has true elements, and the best non-fiction (particularly memoir) has fictitious elements. In retrospect, this intersection should have been intuitive for someone like me, who considered himself a fiction writer, essentially to “write what you know.” In truth, everything that I had written to that point was an easy-to-spot, thinly-veiled version of events from my own life, and my favorite writers (Richard Yates, Raymond Carver, Richard Ford, Walker Percy) all seemed to be doing an exalted version of the same process. After subscribing to David Shields’ vision, though, it seemed absurd to put up any veil, no matter how thin it was. I had been afraid to write directly about my own experiences, because I feared that I would somehow get it wrong, or I’d be too tempted to modify the events to my own liking (or, I should say, my memory’s own liking), or I’d be inviting the people closest to me to counter each and every thing I put down. I bought into Reality Hunger so quickly because, it is clear to me now, I’d been looking for someone to allay that fear. Karl Ove Knausgaard: Over recent years I had increasingly lost faith in literature. I read and thought, this is something someone has made up. Perhaps it was because we were totally inundated with fiction and stories. It had got out of hand. Wherever you turned you saw fiction. All these millions of paperbacks, hardbacks, DVDs, and TV series, they were all about made-up people in a made-up, though realistic, world. And news in the press, TV news, and radio news had exactly the same format, documentaries had the same format, they were also stories, and it made no difference whether what they told had actually happened or not. It was a crisis, I felt it in every fiber of my body, something saturating was spreading through my consciousness like lard, not the least because the nucleus of all this fiction, whether true or not, was verisimilitude and the distance it held to reality was constant. In other words, it saw the same. This sameness, which was our world, was being mass-produced. The uniqueness, which they all talked about, was thereby invalidated, it didn’t exist, it was a lie. Living like this, with the certainty that everything could equally well have been different, drove you to despair. I couldn’t write like this, it wouldn’t work, every single sentence was met with the thought: but you’re just making this up. It has no value. Fictional writing has no value, documentary narrative has no value. The only genres I saw value in, which still conferred meaning, were diaries and essays, the types of literature that did not deal with narrative, that were not about anything, but just consisted of a voice, the voice of your own personality, a life, a face, a gaze you could meet. What is a work of art if not the gaze of another person? 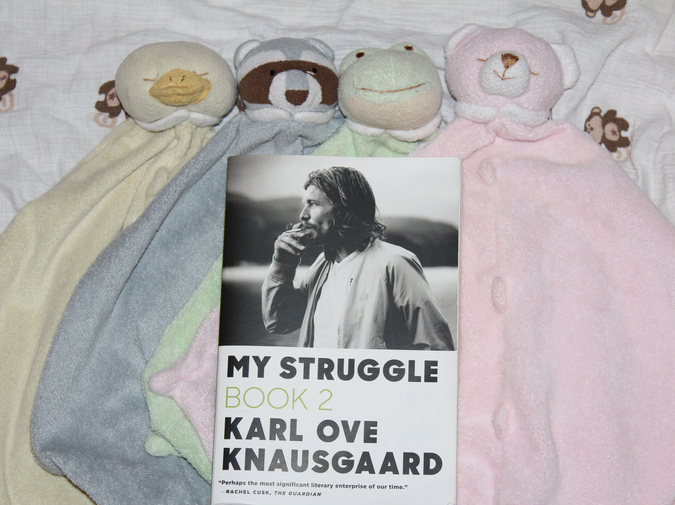 In My Struggle, Book Two, Karl Ove Knausgaard presents himself as a family man and a writer. Much of the book is his trying to figure out if the two roles must be mutually exclusive. He very nearly ruins his marriage and his wife, whose instability is laid bare throughout this volume, by effectively isolating himself from her and their newborn daughter while completing his second novel. Afterwards, when he becomes a stay at home father so that his wife can return to school, he sinks into depression and feels useless without the ability to sit down in a quiet room and write. He bargains for an hour alone at the end of the day, when all he does is visit cafes, read books, and rue the state of his own writing (or lack thereof). More than once, he describes going into a bookstore and buying dozens of books; he lists all the titles, about half of which he confesses that he will never read. To borrow his own phraseology, the voice of his own personality is in desperate search for an outlet. Over meals and beers with his friend, Geir, he has lengthy conversations in which he lets this voice have its say. These prolonged conversations feel like a dress rehearsal for the book in which they’re appearing. In some ways, the second volume of My Struggle is a justification for the work’s existence. The quote above is Knausgaard’s manifesto: this is how I got here, this is why I am writing about these events and these people and these thoughts of mine. There’s a sense of desperation in Knausgaard’s writing-about-writing that mirrors the passion with which David Shields writes about literature in general: this is everything, this is all I can do, this is all I want to do. David Shields: I wonder what it is about white space that’s so alluring. I find that I almost literally can’t read a book if it’s unbroken text. What does such seamless fluency have to do with how I experience anything? (Collage = stutter text.) Whereas the moment I see the text broken up into brief fragments, I’m intellectually and aesthetically and almost erotically alert. Just before extolling white spaces in How Literature Saved My Life, David Shields lavishes similar praise upon writing that uses numbered sections. It’s the same aesthetic principle in general: short (or shortish) sections that, on their own, impart a specific momentum but also invite the reader to insert his or her own directions. As a format, collage is arguably the quintessential embodiment of this aesthetic. As a 21st century reader and writer, I wonder why collage has not become the prevailing literary format by this point. Collage is perfect for someone like me, who sneaks in reading on the subway, considers a twitter feed (at times) to be meaningful, and nods affirmatively when Bret Easton Ellis (on his podcast, virtually every week) equates art with content. My biggest fear, when the first two volumes of My Struggle arrived in the mail, was that I would not be able to get through the books because they contained so few white spaces and, in turn, whether that failure would peg me as typical of the short-attention-span-easily-distracted reader of today. Tim Parks, in the New York Review of Books, recently eulogized the “special energies required for tackling a substantial work of fiction” that cannot be expected of the current, smart phone-carrying reader and predicted that “the novel of elegant, highly distinct prose, of conceptual delicacy and syntactical complexity, will tend to divide itself up into shorter and shorter sections, offering more frequent pauses where we can take time out.” In my case, he’s right. I can’t imagine myself plowing through Midnight’s Children in a week the way I did fifteen years ago. I returned my wife’s surprise gift of Murakami’s 1Q84 because the book was so long, and when I found a list of the 50 best short books compiled by flavorwire.com, I didn’t know whether to be proud or ashamed of how many of those titles I’d read in the past few years. How reassuring, then, to find myself being sucked into My Struggle and its page after page after page without a break! I’ve been looking forward to train delays for the extra reading time they’ve granted and have foregone my own mid-afternoon weekend naps (which I typically steal during my daughter’s nap) to return to Knausgaard. David Shields: As a work gets more autobiographical, more intimate, more confessional, more embarrassing, it breaks into fragments. Our lives aren’t prepackaged along narrative lines and, therefore, by its very nature, reality-based art – underprocessed, underproduced – splinters and explodes. My brother pushed the latest Sun Kil Moon album, Benji, on me earlier this year, and I went through a period where I barely listened to any other music besides that album. Over his last two albums, Mark Kozelek (who is Sun Kil Moon) has mastered a confessional lyrics style that firmly positions Benji as album-as-memoir. We learn about deaths and illnesses in his family, first sexual experiences, bouts of depression, resentment of more successful musicians, and his father’s flirtations with the girls at Panera Bread, among other subjects, in Benji’s 11 songs. Coincidentally, during the time I was obsessively listening to Benji, Stephen Malkmus, the lead singer of Pavement, was a guest on Marc Maron’s WTF podcast. In college, I worshipped Pavement and, by extension, Malkmus; his detached, jaded, and sarcastic style was, for me, the epitome of cool. I tried to dress like him and even found myself talking like him (I was fanatical enough about the group that I tracked down nearly every interview to which the reclusive Malkmus condescended). Fifteen years later, listening to the WTF interview and hearing Malkmus try to use his patented irony to counter Maron’s equally patented sincerity, I felt embarrassed for my former hero. Perhaps it was the platform – Maron’s podcast is especially beloved as a place for artists to bring out their true selves – but I couldn’t help thinking that Malkmus sounded ridiculous and, more specifically, anachronistic. His refusal to open up about himself made him seem as if he’d just emerged from a 1990s time capsule, along with reruns of Seinfield (cf. Curb Your Enthusiasm and Louie and even Seinfeld’s current web series, Comedians in Cars Getting Coffee) and a laser disc ofBraveheart (cf. The Hurt Locker and Zero Dark Thirty on Blu-ray). We are firmly entrenched in an artistic moment of honesty and transparency, or in the very least (as I think Reality Hunger is arguing) the semblance of honesty and transparency. Boundaries are being broken, not just between fiction and non-fiction, but also between artist and audience. Since those summer days beside the pool, whether it’s reading the artfully composed collage of David Shields or My Struggle’s first thousand pages of virtually unbroken test, I’ve come to realize that, as long as a writer is willing to chip away at those boundaries, I am ready to share the experience.